Summary: This is the third book of the Grisha trilogy. This review will contain spoilers for the first two books. You can read my reviews for the first two here and here. After the last major attack from the Darkling, Alina Starkov is severely weakened, and hiding underground among the vast community of Ravkans who pray to her name. 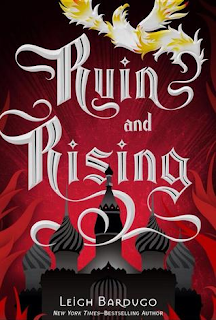 They are on the run yet again, and Alina knows that the only way she can truly defeat the Darkling is to find the mythical firebird and unite all three of Morozova's amplifiers in order to gain the power necessary to go up against his shadow army. But as she and her loyal crew embark on their quest and fight battles at every turn, she starts to wonder if the cost is too great. And when she learns the truth about the third amplifier, she finds that the sacrifice required to wield that power may be greater than she's willing to pay. Thoughts: WONDERFUL. A wonderful and spectacular end to a well-written series! Because it's the last book, everything feels incredibly high stakes, and some things happen to beloved characters that had me feeling heartbroken. I was definitely feeling all the feels. All the characters in this series are so lovely and complex. Alina is not a perfect hero, the Darkling is not completely a villain, and even Mal, whom I'd initially judged as the Gale to Alina's Katniss, shows some surprising depths. And the cast of side characters is amazing as well: Nikolai, Genya, Tamar, Tolya... even the ones that are introduced just in this book are interesting. And some of the more abhorrent characters in my opinion (the Apparat, the King) aren't even THE villain. There are a lot of wonderful parallels to be drawn between the events of this book (or even, the entire series) and the epic hero quest, a la The Odyssey. (Sorry, once an English teacher, always an English teacher.) If I could teach this book, I probably would. I was sad that this was over. I could probably read a few more books about these characters in this universe (I know, Six of Crows takes place in this universe), but all good things must come to an end.